Widely adapted with proven performance, Pardee birdsfoot trefoil was developed by the Cornell University Agricultural Experiment Station in Ithaca, NY. This upright, hay-type variety has an earlier maturity than both Norcen and Viking. Pardee was derived from a mixture of trefoil varieties and plant introductions. This genetic material was selected for vigor and resistance to Fusarium wilt. The result is a forage with greater disease resistance, better stand persistence and higher yields. Pardee can be used on poorly drained soils but will perform well on good soils, too. It has vastly improved winter survival over other trefoil varieties and recovers quickly after cutting. All of these characteristics contribute to higher yields over the life of the stand when compared to other varieties. 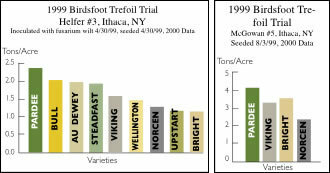 In 1999 yield trials in New York, Pardee was the highest yielding variety in the first production year, was 37% more resistant to Fusarium wilt than unselected experimental varieties and 17% more resistant than Norcen and had the greatest number of plants per square foot in the first production year.